Raspberry Snitter — always with butter. In the bowl of a stand mixer fitted with a paddle, combine the flour, sugar, and salt. Add the butter and the egg, and mix on low until fully incorporated and the dough starts to come together in a ball. On a lightly floured piece of parchment paper, roll out the dough to a 16 x 9-inch rectangle. Trim the edges, combine the edge pieces into a ball and set aside. Cut the dough evenly into two pieces (about 8 x 4 ½ inches) and prick all over with a fork or skewer. Place the parchment paper on a half sheet pan, and place the pan in the fridge until the oven preheats. Roll out the ball of edge pieces into the same thickness. Using a small cookie cutter (I used a star), cut out as many little cookies as you can fit. Place on a parchment lined baking sheet and place in freezer. Bake the shortbread 15-20 minutes, until the edges are lightly browned and the shortbread is baked all the way through. Let the shortbread cool on the pan on a wire rack. Then bake the little cookies, mine took about 7 minutes, it will just depend on how big or small they are. Just keep checking. When the shortbread has cooled, spread the raspberry jam on one half. Place the other piece of shortbread on top, and spread the icing over the top. Spread the remaining icing over the small cookies. Then place on top of the shortbread, adhering with a dot of icing, if the icing has set on the large cookie. Carefully cut into pieces, and serve. These reminded me of the royal empire cookies I used to get on the granville island public market when I lived in Vancouver. They were my favorite treat to get after class. 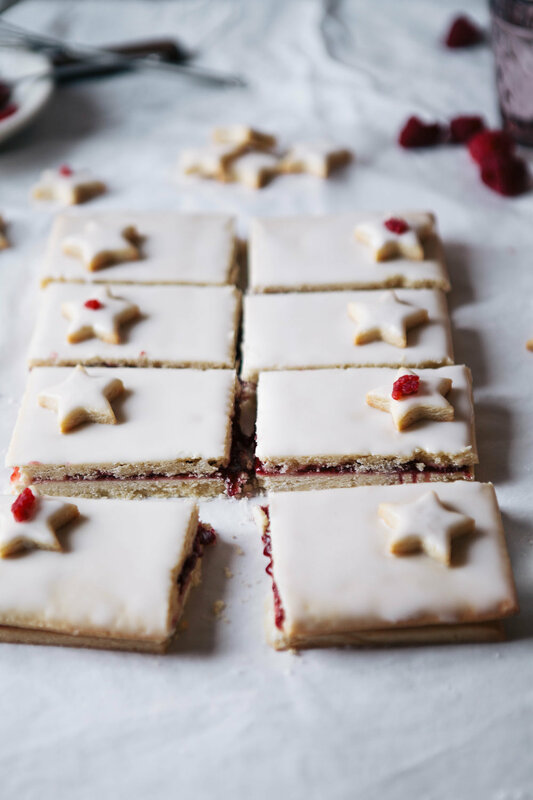 They were pretty much the same as these, shortbread, raspberry jam and icing. I haven't been able to find royal empire cookies anywhere besides that market so when I came upon Sarah Kieffer's recipe for these I knew I had to make them. Every recipe I have made of her's always comes out amazing so I knew this would be no different. They are just like my beloved royal empires. Definitely satisfied my constant cravings for them and now I have an amazing knew cookie recipe for my rotation.